The nonlinear circuit with serial–parallel memristors shows special internal characteristics and external performance, which indicates that the serial–parallel memristors can greatly change the dynamic characteristics of the nonlinear system. Mathematical model of the system is established to analyze the influence of the serial–parallel memristors on the dynamical behaviors with the change of system parameters, and then the basin of attraction is used to exhibit the coexisting multiple attractors with different initial conditions and the serial–parallel memristors, which can reveal that the serial–parallel flux-controlled or charge-controlled memristors have different effects on the generation of chaos and multistability phenomenon. Moreover, the hardware description of memristor-based system through FPGA is realized by Verilog language and the experimental results are observed from digital oscilloscope. 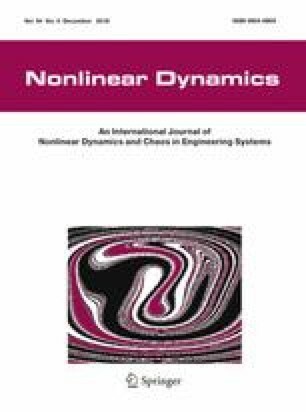 Finally, based on the Lyapunov stability theory and adaptive control law, a nonlinear controller is designed to achieve the adaptive generalized synchronization between five memristor-based chaotic systems, and numerical results of the adaptive generalized synchronization are presented to prove the correctness and effectiveness of the proposed method. This work is supported by the National Nature Science Foundation of China under Grant No. 61871230, the Natural Science Foundations of Jiangsu Province under Grant No. BK2018021196 and the Postgraduate Research and Practice Innovation Program of Jiangsu Province of China under Grant No. KYCX18_1220.